A member of the cabbage family Cruciferae and related to mustard, radishes and horseradish, wasabi (Wasabia japonica) is a strong spice used to season sushi, sashimi and other foods. What makes wasabi healthy is its extreme pungency which is responsible for its impressive antibacterial properties, among other beneficial effects. But wasabi is not something everyone should eat because its sought-after pungent flavor and source of health benefits is also bad for some conditions, especially those of the digestive and respiratory systems. How wasabi tastes so spicy. Wasabi is a special kind of spice because, unlike hot chili peppers, turmeric or other spices, its pungency does not stay in the mouth. When you start eating wasabi, it releases aromatic compounds into the mouth which then travel into the nasal passage where they irritate the mucous membranes so badly they produce a strong, pain-like burning sensation that people interpret as spiciness, hotness or pungency. Eating too much at once can make anyone cry with pain. Yet so many people keep on eating wasabi, unknowingly or disregarding the fact that it is not an universally healthy food or good for everyone. 1) Bad for gastritis. Extremely spicy foods like wasabi are generally bad for gastritis. The aromatic compound in the plant responsible for its strong flavor, called allyl isothiocyanate, is a naturally-occurring irritant meant to protect the plant from being eaten. At the same time, it can have a strong irritating effect on the stomach lining and worsen an existing gastritis. Eating too much wasabi or simply too often can trigger gastritis even in those without an existing condition, but with a predisposition towards stomach acidity. Pungent foods in general like wasabi, horseradish, hot chili peppers or ginger are all bad for gastritis. 2) Causes indigestion and heartburn. What people look for when they eat spicy foods is the kick they get when they experience an overwhelming pungency. But this pungency doesn’t limit itself to the mouth like in the case of hot chili peppers or the nose like in the case of wasabi. This pungency continues at varying intensities in the digestive system, causing irritation of sensitive mucous membranes. An irritated esophagus will produce a temporary and mildly painful burning sensation. Furthermore, an irritated stomach will regurgitate its contents along with digestive juices in the esophagus, burning the sensitive mucous lining and causing the sensation known as heartburn. 3) Worsens acid reflux. Wasabi falls into the category of foods that cause acid reflux and it, along with other pungent spices and foods, are bad for gastroesophageal reflux. 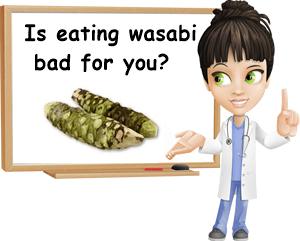 So while someone who does not suffer from any digestive disorder can eat wasabi in moderate amounts, as part of a balanced and healthy diet, a person with stomach acidity, heartburn, gastritis or stomach ulcers will experience more intense symptoms and, over time, a deterioration of their condition. And since wasabi is bad for acid reflux, this makes it bad for pregnancy too because pregnant women suffer from acid reflux more severely as the pregnancy develops and foods like these will surely not help. 4) Bad for hemorrhoids. Wasabi is bad for hemorrhoids first of all because it slows blood coagulation which can result in hemorrhoids bleeding more easily. This, in turn, can cause a more pregnant iron deficiency and anemia in hemorrhoids sufferers. Secondly, wasabi is bad for hemorrhoids because of its irritating nature. What you experience as hotness or spiciness is in fact an irritation of mucous membranes. And this irritation continues as the pungent compounds in wasabi travel along the digestive tract. Even at a reduced intensity (as mentioned above, wasabi loses most of its flavor profile if left to sit in the open air after being prepared) it can damage the sensitive blood vessels that are hemorrhoids, causing irritation, a burning sensation, pain and bleeding. Read more about problematic foods for hemorrhoids. 5) Can cause laryngospasm or asthma attack. Having an asthma attack from spicy foods is not that uncommon. Spicy foods produce pungency by irritating mucous linings in the mouth and throat especially. Irritation of the throat lining generates inflammation, production of mucus to counteract it and narrowing of the airways. This can create a predisposition for a laryngospasm or even asthma attack in those with existing conditions. Wasabi in particular has a kick to it that can almost be compared to a shock of the senses, so chances are it may not be safe for someone with recurrent laryngospasms or asthma attacks to eat such spicy foods (see what are laryngospasms). Moreover, it causes nasal congestion which also increases risks for such breathing problems. Secondly, wasabi can cause a laryngospasm or asthma attack indirectly, as a result of its side effects on the digestive system. Gastritis or indigestion causing acid reflux and heartburn are strong triggers for laryngospasms and asthma, so make sure to avoid strong foods such as wasabi if they cause you acidity and heartburn if you already have asthma. 6) Increases risk of hemorrhage. Wasabi is a blood thinner because, slowing down blood coagulation. While this property of the spice may hold benefits for those with blood clots or high blood pressure, the fact that it slows blood coagulation means eating wasabi can potentially lead to easy bruising, bleeding gums, nosebleeds, bleeding hemorrhoids or pose risks for anyone undergoing surgery. Talk to your doctor about whether or not eating wasabi is safe for you if you suffer from blood disorders. How is wasabi made. Wasabi is made fresh by simply grating a wasabi stem. The stem is washed, then any bumps where the leaves might have been are removed to make the grating easier and guarantee the best possible flavor. A fine grater should be used and the resulting wasabi left to sit for a few minutes to produce its rich flavor. This is essential how fresh wasabi paste is made. Flavor peaks at around 15 minutes and will start decreasing from that point on. Conclusion. Wasabi is a spice that tastes extremely pungent, which is the main reason people like it. To add to its popularity, its spiciness has a strong antibacterial activity which is believed to bring benefits to one’s health. But the same compounds that make it spicy are strong irritants for the digestive and respiratory system and can affect blood coagulation processes. 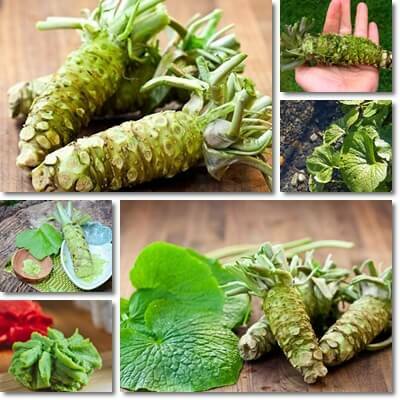 If you are suffering from various digestive disorders, blood coagulation problems, laryngospasms or asthma, then eating wasabi might just not be good for you. thnx for such an enriching article..